UP 72825 PRT Latest News (31.08.2016): Once again, the final decision on the selection of 72825 PRT has been delayed. It is expected that the decision on the final selection list will be declared very soon. 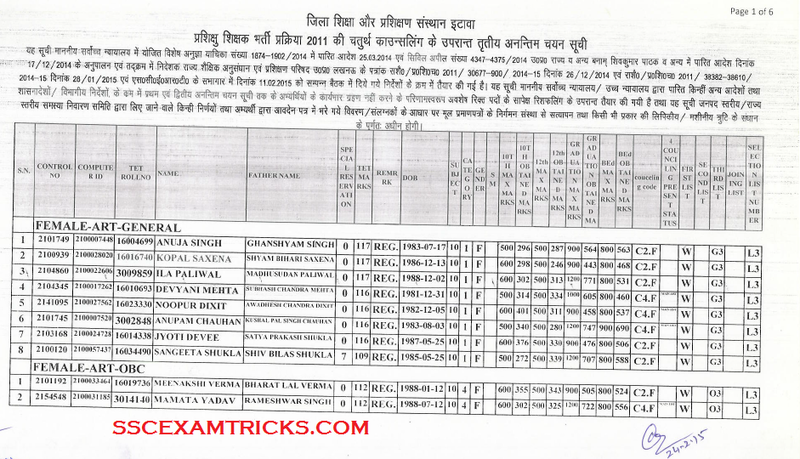 The Joining of PRT Candidates includes name, father's name, DOB, District name, Subject, Category, Graduation marks, TET Marks and Gender of the candidates. Candidates can download UP PRT Joining All District PDF File from here. Latest News (06.04.2016): UP 72825 PRT First Salary Dispatched: The latest news is that UP Basic board has dispatched first salary of 72825 PRTs up to March 2016. The selected candidates can read complete news in details from the below image. UP Basic Education Board has released final selection list of PRT on official website www.upbasiceduboard.gov.in. 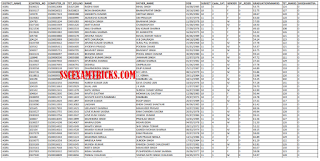 The Final Allotment List of All districts i.e. Agra, Chandauli , Chitrakoot , Deoria , Etah , Etawah , Faizabad , Farukkhabad , Fatehpur , Firozabad , Gautam Buddha Muzaffar Nagar , Pilibhit , Pratapgarh , Raebareli , Rampur , Saharanpur ,Kanpur Dehat , Kanpur Nagar , Kaushambi , Kushi Nagar (Padrauna) , Lakhimpur Kheri , Auraiya , Azamgarh , Baghpat , Bahraich , Ballia , Balrampur , Banda , Barabanki , Bareilly , Basti , Bijnor , Nagar , Lalitpur , Lucknow , Maharajganj , Mahoba , Mainpuri , Mathura , MAU , Meerut , Mirzapur , Moradabad ,Agra , Aligarh , Allahabad , Ambedkar Nagar , Ghaziabad , Ghazipur , Gonda , Gorakhpur , Hamirpur , Hardoi , Hathras , Jalaun , Jaunpur , Jhansi , Jyotiba Phoole Nagar , Kannauj , Budaun , Bulandshahar , Sant Kabir Nagar , Sant Ravidas Nagar , Shahjahanpur , Shravasti , Siddharth Nagar , Sitapur , Sonbhadra , Sultanpur , Unnao , Varanasi has declared with Joining detail on official website in PDF File. Uttar Pradesh Basic Education Board has released 5th Counseling letter on 18th March 2015 on the official website for the counseling which is going to be conducted 19th March 2015 to 23rd March 2015 for the selection of General / UR & reserve category candidates. The 4th cut off Marks had released on district wise official website of State. Those candidates who had joining as Prishkshu Shikshak (PRT) can not take part in 5th couseling session. 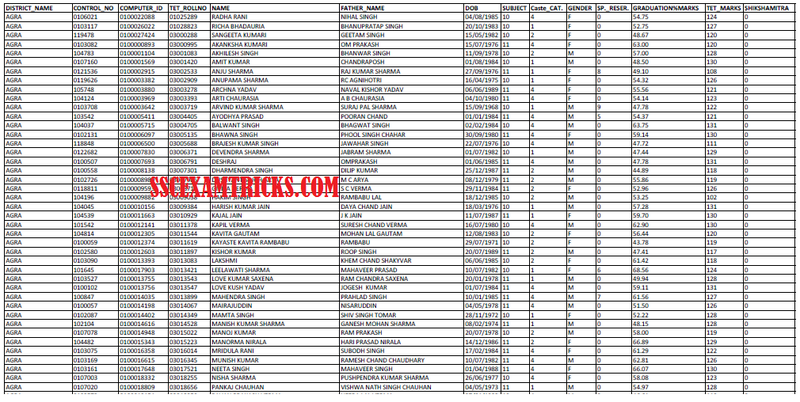 The selection will be made based on the marks/ percentage obtained in UP TET 2011. The percentage for General Category candidates is 70% and 65% for reserve category. In case the seat remains vacant then the percentage marks can be reduce to 60% for reserve candidate. UP Basic Edu Board is going to conduct 5th Counseling from 19th March to 23rd March for several district on the remaining seat of PRT based on 4th Cut off Merit list released on the official website. The appointment letters will be delivered to selected candidates in UPTET 5th Counseling from 26th March onwards.Candidates must bring two photocopy set of all original documents i.e. 10th , 12th , Graduation DMC, Age proof like school leaving certificate or any other, Photo identity proof like Pan Card, Voter Card ID etc., Final Result Merit List Copy, Address proof i.e. Ration Card, Aadhar Card, Voter card or Driving License, Two extra colored recent passport size photograph, Caste/PWD/EXS certificate to claim for seat available for reserve category, UP TET 2011 Certificate, Original Affidavit (Shapath Patra) of the candidate for Joining, Any other Relevant document that candidate mentioned at the time of application for PRT posts. The two set of photocopy of original documents must be set in a file which will be deposited at the time of getting appointment letter/ joining for these posts. 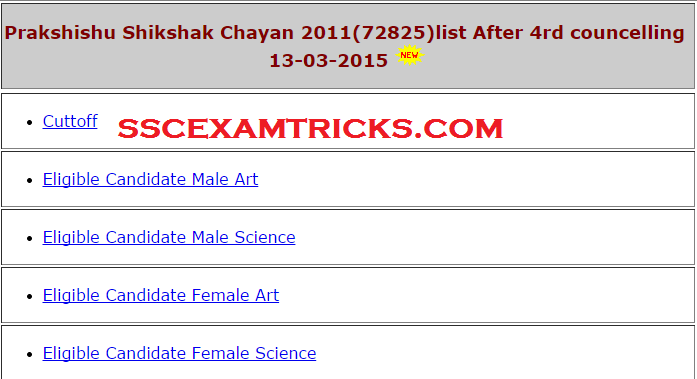 UPTET has released 4th cut off marks, list of eligible candidates (Male/ Female) on several districts official website on 13th February 2015 and appointment letter of these selected candidates will be released by their Basic Education Officer on 16th March 2015 at 10:00 AM onwards for several districts. 4th Cut off Marks of kannauj District - The 4th Cut off Marks has released and appointment letters are going to be issued on 16th March 2015 at 10:00 AM. 4th Cut off Marks of Bareilly District- The 4th Cut off Marks has released on district official website. UPBSE had conducted 5th Counseling for vacant seat of 4th Counseling from 04th March 2015 to 09th March 2015. The Merit list for 4th round selection list has released on 07th March 2015 on the respective district website of Uttar Pradesh on the vacant seat of counseling 1st, 2nd and 3rd round selection list. The 4th Selection list will be released in the first week of month March i.e. 7th March 2015. 5th Counseling will be held for Reserve and Non Reserve Candidates vacant seats on several districts. The 4th Cut off Merit list will be prepared for those candidates who scored 60% marks (90 Marks) in UPTET in Reserve Category. The 4th Cut off Merit list will be prepared for those candidates who scored 70% marks (105 Marks) in UPTET in Reserve Category. These candidates will be called for 5th Counseling done which will start from 09th March 2015. 1st Counseling Date- 29th August 2014 to 31st August 2014. The Latest news is that UPBSE has released 5th Counseling Schedule for the vacant sheet of PRT which is going to be held in the first week of March 2015 and will start from 9th March 2015. The 4th Cut off Merit List will be released on 07th March 2015 on the respective district website of UPBSE. UPTET 3rd Round Selection list has been released on the district website in which seat vacant in 1st round and 2nd round selection list got filled by eligible candidates for the posts of Primary Teacher or Prashikshu. The 3rd Round Selection list/ Merit list/ Cut off Marks Details of several districts has been released after reshuffling of vacant seat of both 1st and 2nd selection list on the official website by UP Basic Education Board. The UPBSE will release Final selection list of the candidates of all the districts on the respective district official website based on the priority of district wise selection merit list. The 3rd Round Selection Merit list is available on the direct link provided below. Those candidates who had applied and waiting for 3rd Round Selection List can check the latest update on the respective diet district. 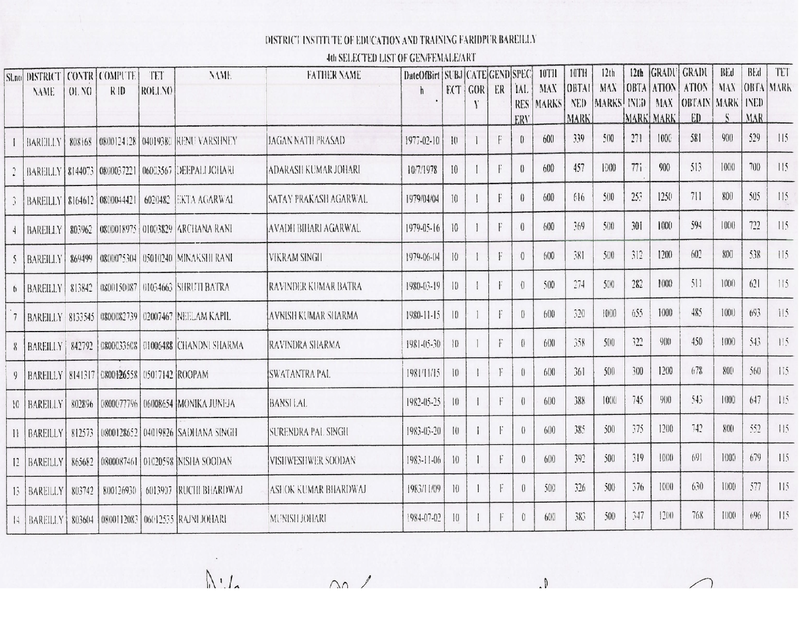 The 3rd Round selection list contains name of candidates, Control no., Computer ID, Father name, special reservation, TET Marks, Remark, Date of Birth, Subject, Category, 10th, 12th, graduation marks detail, 4th Counseling status, 1st, 2nd, 3rd Joining List and selection list number of the candidate. Check other districts from the direct link provided below in the table. 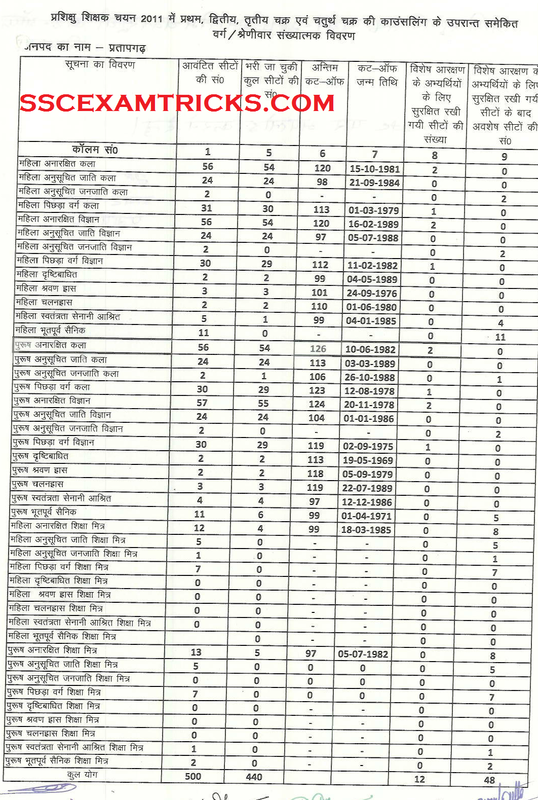 UP 72825 PRT Appointment / Joining Letter Details: The Final List of Selected candidates will be released with name of candidates, father’s/husband name, date of birth, permanent address and category of the candidates. It will display the marks obtained by the candidate in the merit list. The Final Merit List will be displayed descending wise marks details in the excel sheet which can be download from the official website. A direct link will be provided on the official website to download Excel File of Final Selected List Candidates. Candidate must check carefully their name along with father name and permanent address in the Final List/ Merit List of Candidate. Candidates can download Final Merit List of Primary Teacher whenever it gets released on the official website. These Finally Selected candidates will be sent appointment letter which will be released on the official website. Finally Selected Candidates can download their appointment letters on the official website whenever it gets released. It is in news that Final Selected Candidates will be done about 10-12% than required candidate. The list will be released along with waiting candidates. These candidates will be taken in waiting lists. In case, if any candidates will not join/report the station after the release of appointment letter, then these candidates who are in waiting list will be called as replacement of appointee. UP BSE, 75% seats for the post of 72825 PRT have been filled. The counselling will conducted on 25% vacant seat of PRT for various district. More than 10 times candidates will be called for counselling for the post of 72825 Primary Teachers Posts. Candidates can download the appointment letters for 4th district wise counselling on the official website. Those candidates who have applied for the post and waiting for Merit List for 4th Counselling can download merit list or cut off list on the direct link provided in the end of the post. UP TET Marks Available - It is also in news that UP Board is distributing TET 2011 Certification to those candidates who had scored more than 82 Marks. 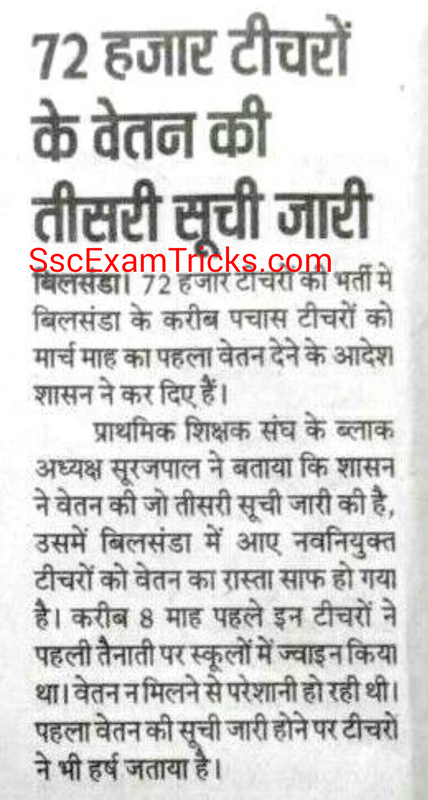 It is also in news that UP Board is distributing TET 2011 Certification to those candidates who had scored more than 82 Marks. The distribution of the UPTET Certification will be done from 18th February 2015 to 25th February 2015. Earlier UP 72825 2nd Round Cut off had been released for most of the districts and joining letters had been dispatched to these selected candidates. A total of 52919 candidates had been given Appointment letters out of which total 35193 had joined the schools. Even then some districts are still remaining for distribution of joining letters which will be distributed very soon. The UP Board has also released the marks obtained by the candidates in TET 2011 for both Primary and Upper Primary class teaching aspirants. Those candidates who had appeared in the examination can download their marks by entering their roll no. in link provided below. 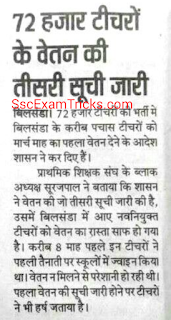 It is the latest news that UPBSE TET 4th Counseling Finally Selected Candidates Merit List for 72825 PRT will released on 17th January 2015 on the official website of UP Board. The appointment letter will be released after the final selection of the candidates for the posts of 72825 Primary Teacher (PRT) in the various districts in all over the state (Uttar Pradesh). The distribution of appointment letter will be done on 19th January 2015. The UP BSE 4th Counseling will be held category wise along with district wise. This schedule will be ended on 15th January 2015. The UP Board will be expected to release appointment letters of selected candidate after 4th Counseling. It is expected to be released before 31st December 2015 on the priority basis. Schedule of Counseling is going to be done on 9th, 10th & 11th January 2015. These three days are reserved for all male candidates from reserved and unreserved category. Schedule of Counseling is going to be done on 12th, 13th & 14th January 2015, next three days are reserved for all female candidates from reserved and unreserved category. UP BSE declared 4th Counselling schedule which will be conducted from 7th January to 15th January 2015. The district wise counselling will be done on scheduled time. As per latest notification of UP BSE, 75% seats for the post of 72825 PRT have been filled. The counselling will conducted on 25% vacant seat of PRT for various district. More than 10 times candidates will be called for counselling for the post of 72825 Primary Teachers Posts. Candidates can download the appointment letters for 4th district wise counselling on the official website. Those candidates who have applied for the post and waiting for Merit List for 4th Counselling can download merit list or cut off list on the direct link provided in the end of the post. 1. Click on the direct link provided below. 3. The Appointment Letter will be downloaded in PDF. 4. Save and print the Appointment Letter Hard Copy for joining the appointed place. 5. Note down the Date, Time & Name of Appointed School from the appointment letters. 6. Report the appointed school on time. For more details and updates, visit official website. 3. The Final List of Selected Candidates/ Merit List will be downloaded in PDF. 5. Press Enter till you don’t find your name.